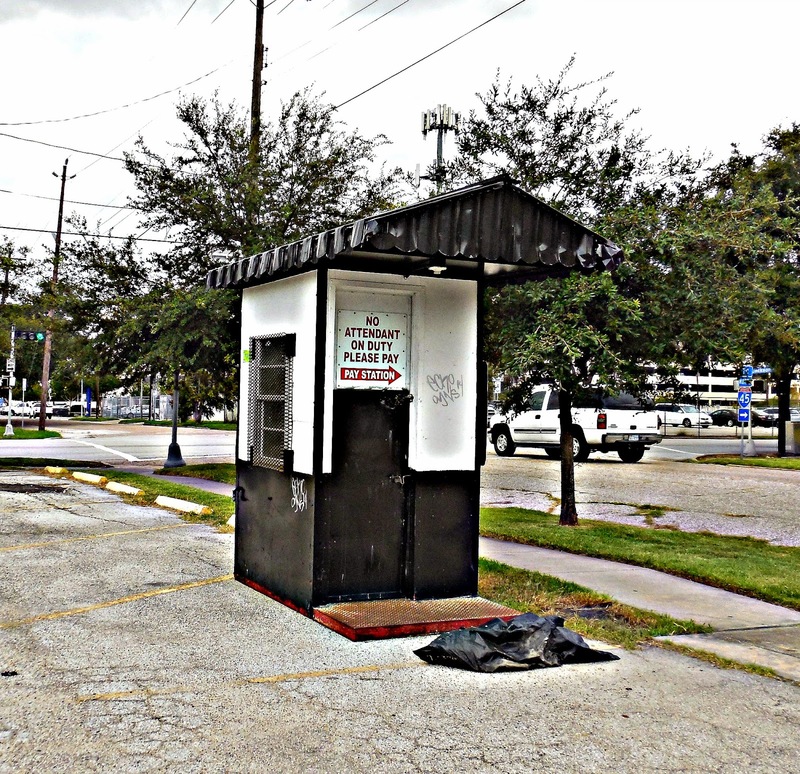 ***Update: Portions of my post were featured in the Gray Matters column on the Houston Chronicle website on September 3, 2014. 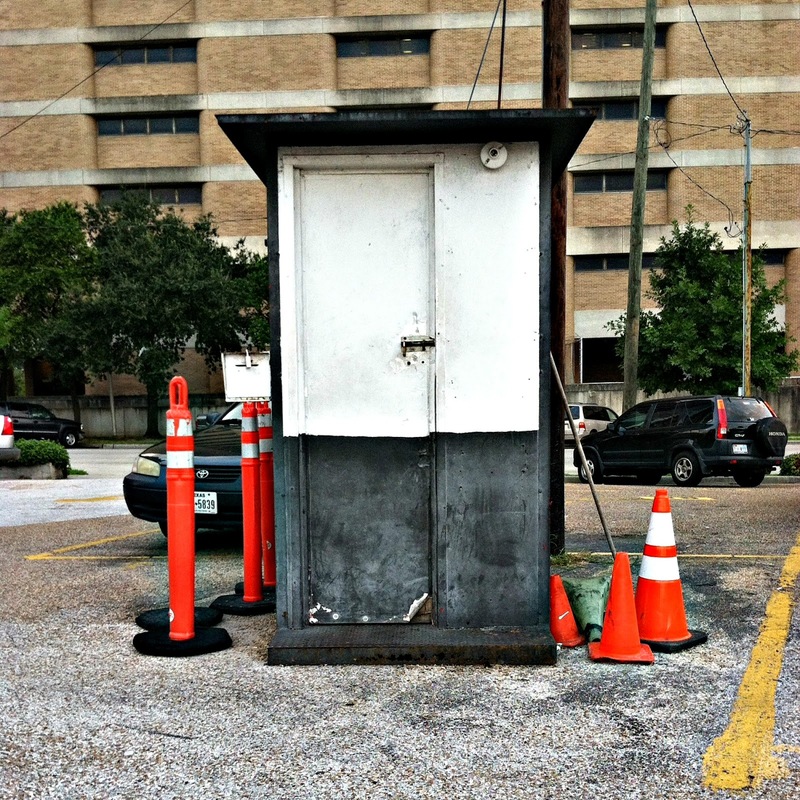 Houston is a city of commodities. 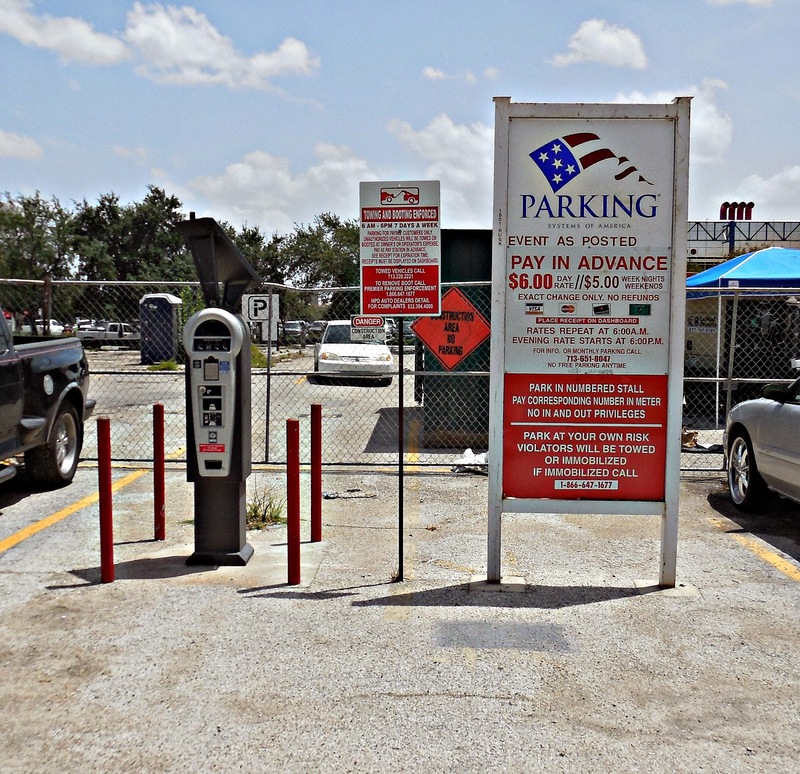 In order of importance, parking ranks a close second right behind oil. 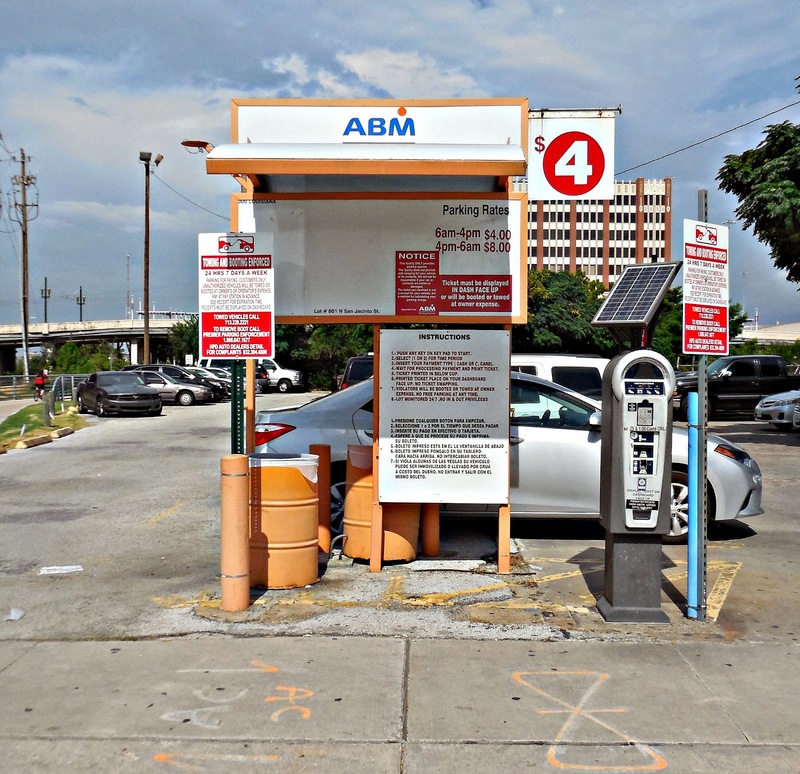 We love our cars, and Houstontians need somewhere to store them when they drive themselves to work. 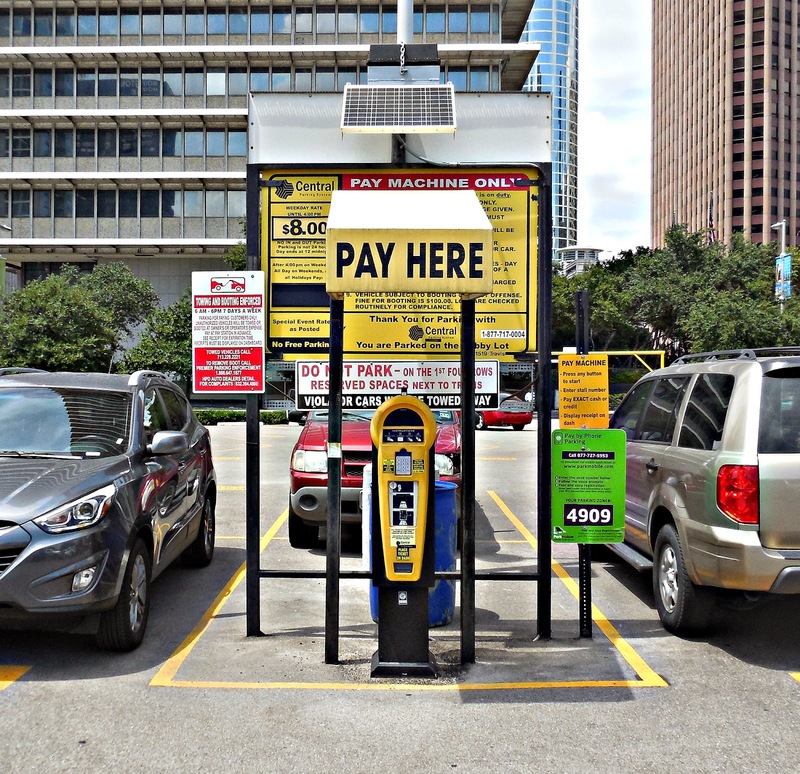 Roughly 57 percent of all Downtown Houston workers drive alone to work, so that means there's a great number of cars that need parking spaces on any given work day. 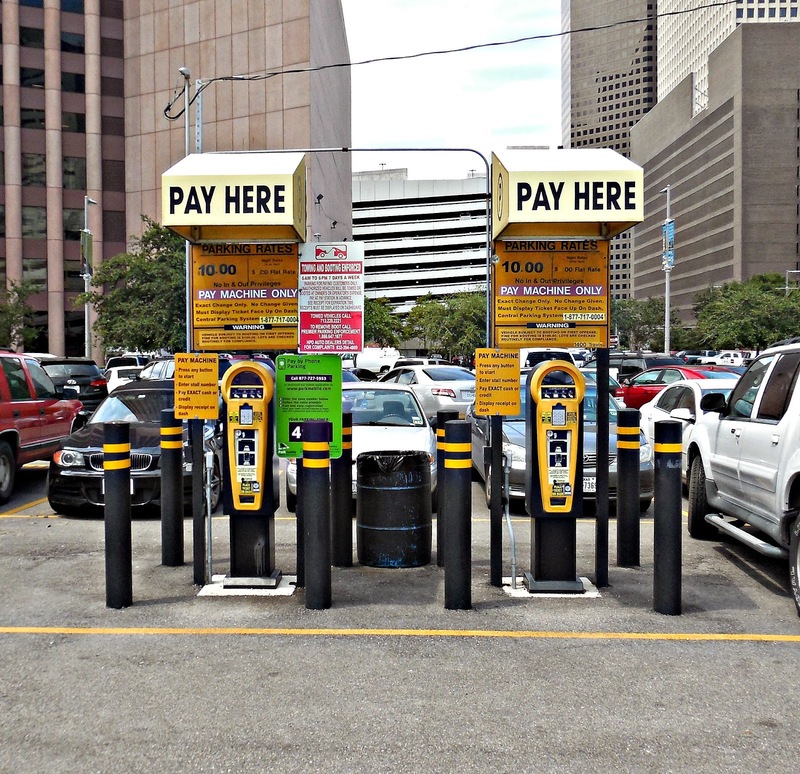 Some estimates have almost 22 percent of Downtown Houston being covered with surface parking, and almost another 4 percent covered by parking garages. 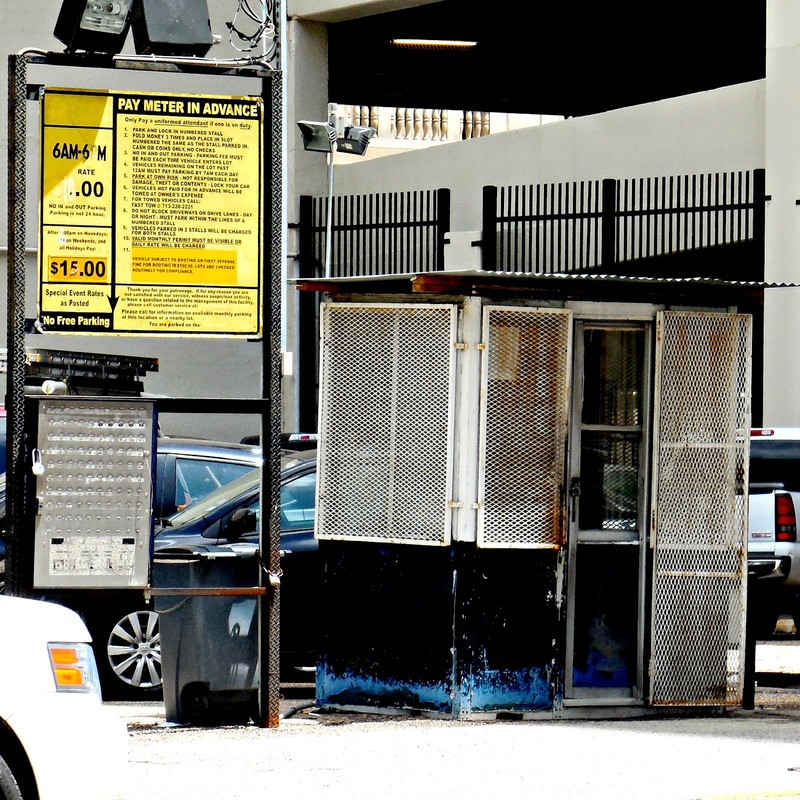 These numbers have fluctuated somewhat in the past few years, but are probably still somewhat close. 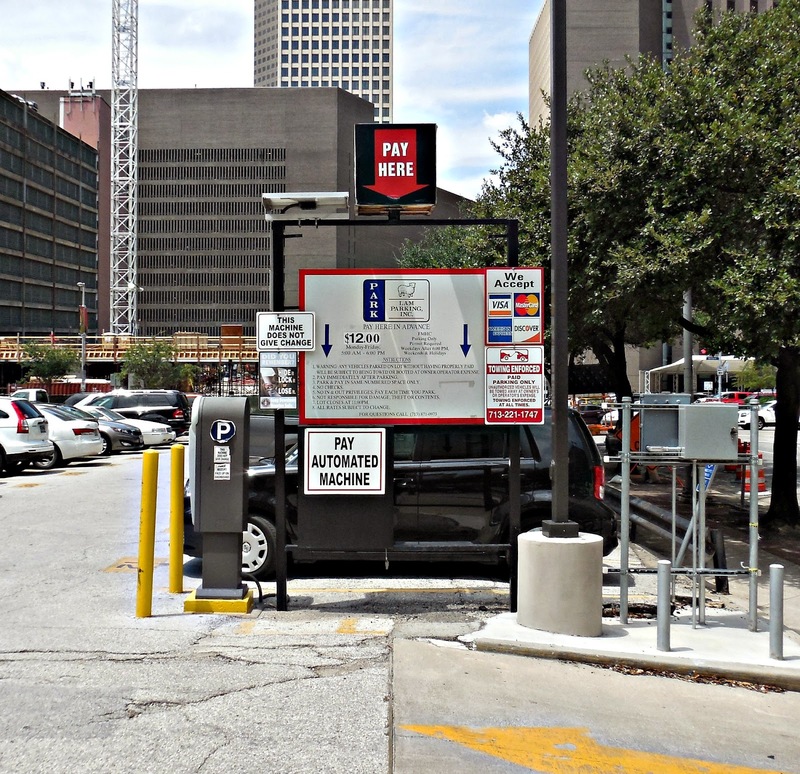 Just take a look at Downtown Houston's parking map to make an estimate yourself. 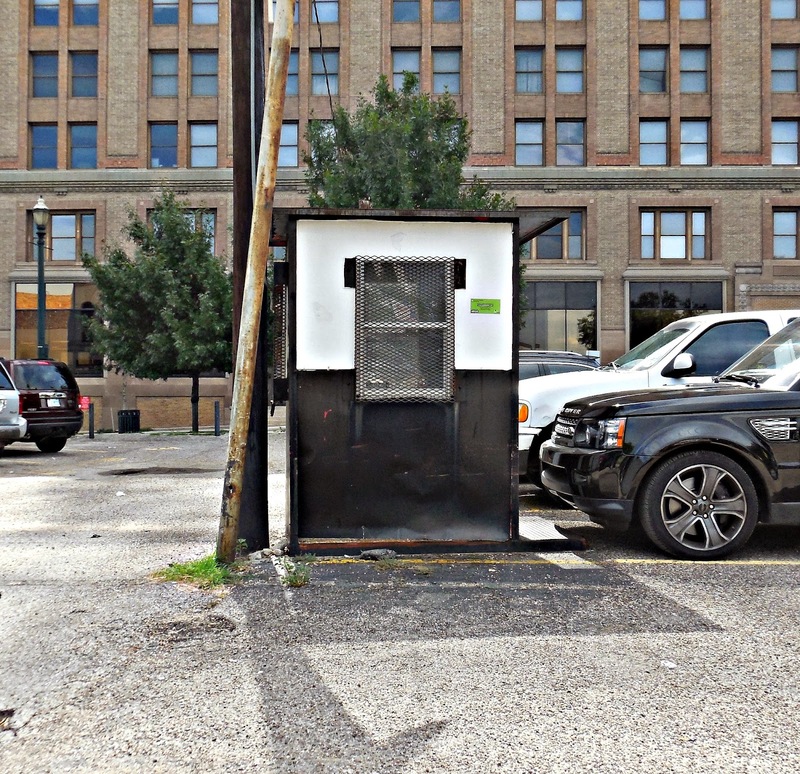 It's been a long standing position of urbanists that American cities are haunted by too many parking spaces, leaving productive land underutilized. 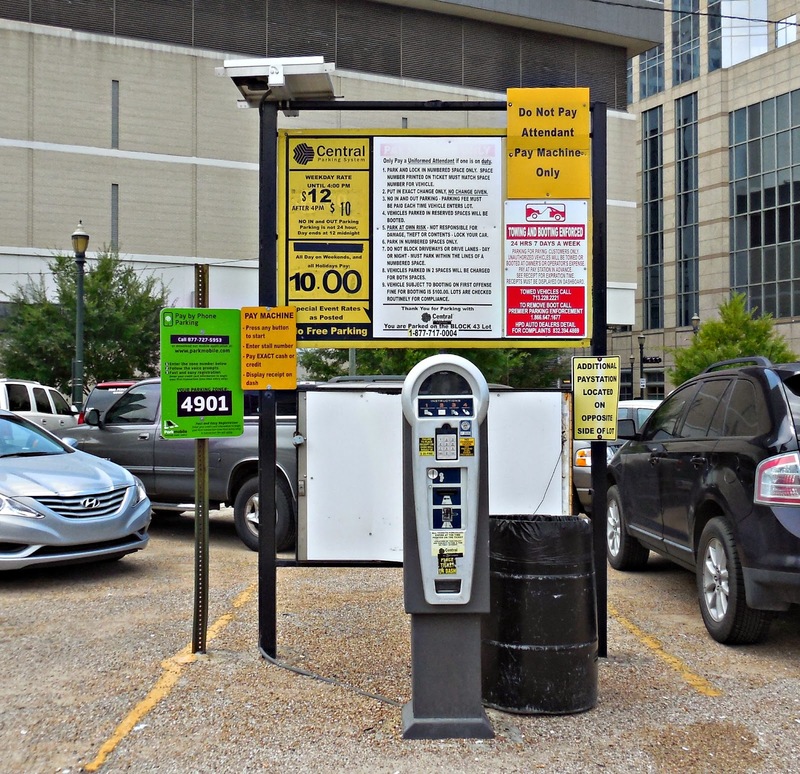 Parking lots have become the scourge of our downtowns. 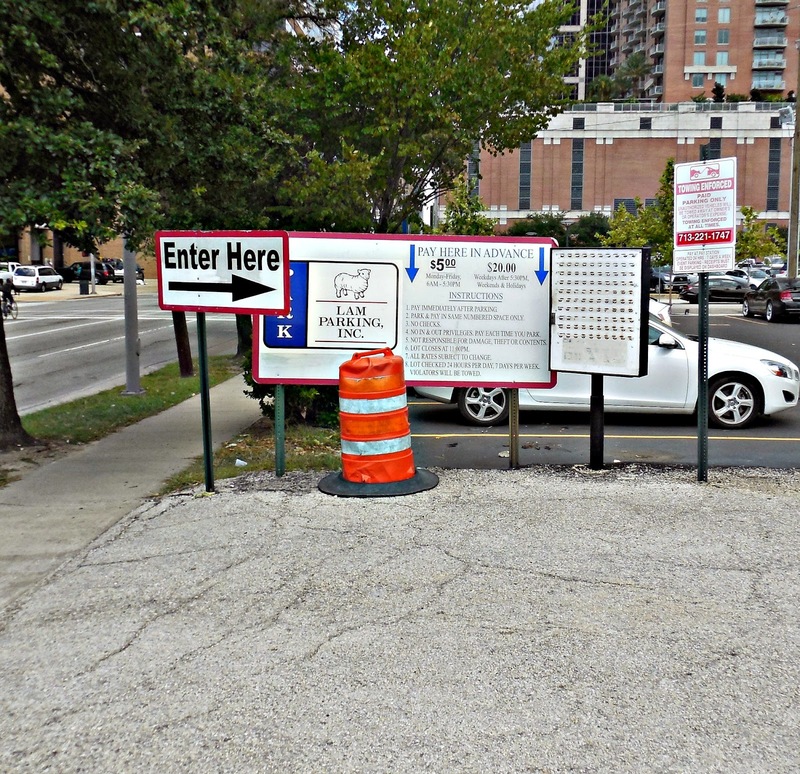 Streetsblog even documented some of our country's biggest urban parking craters, labeling them cancers to downtown districts. 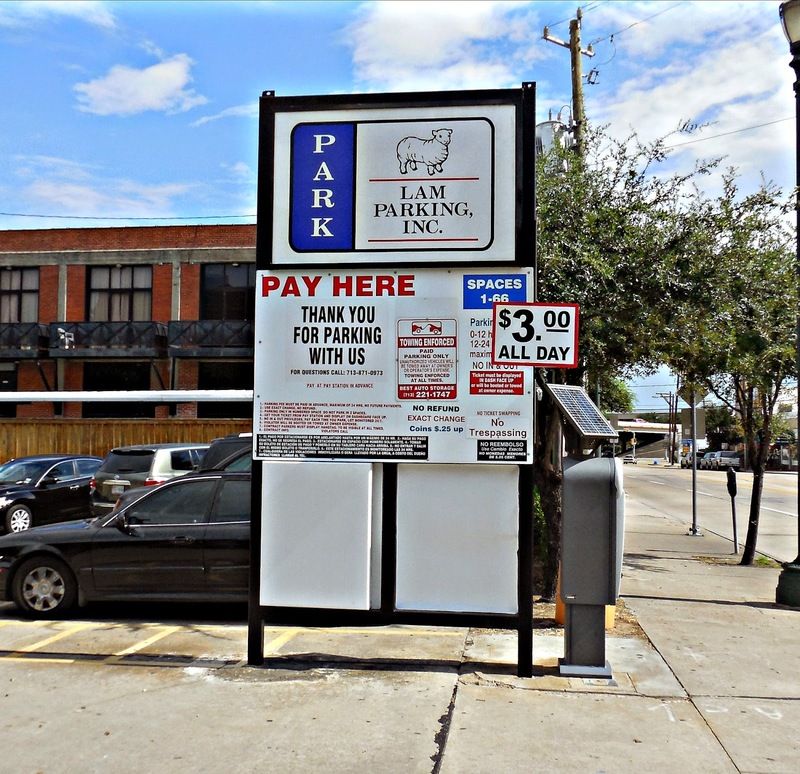 Surface parking is something that is a convenience in Houston, even in our downtown. 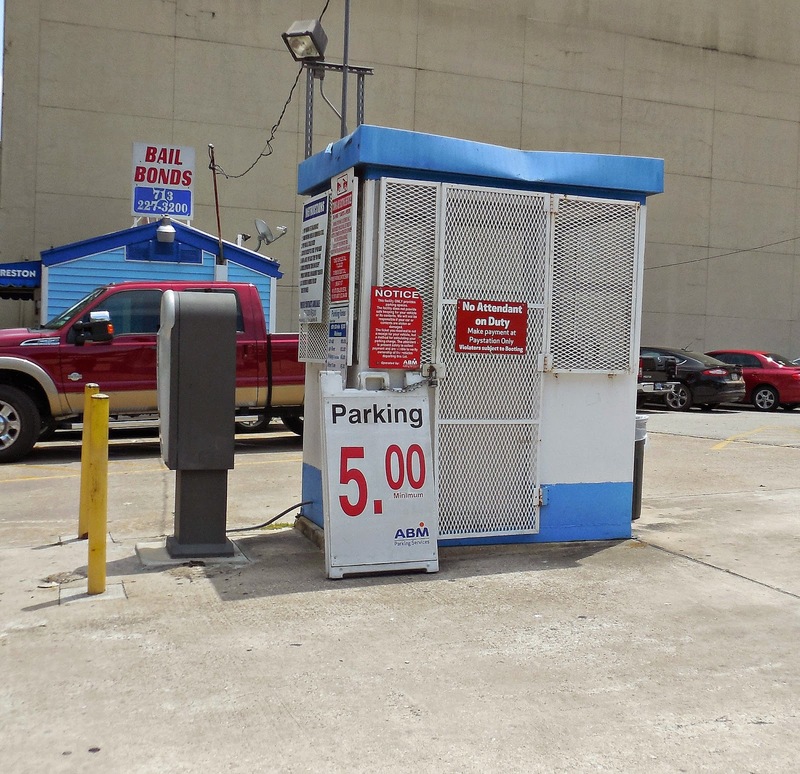 It's far too easy to find parking in Houston. 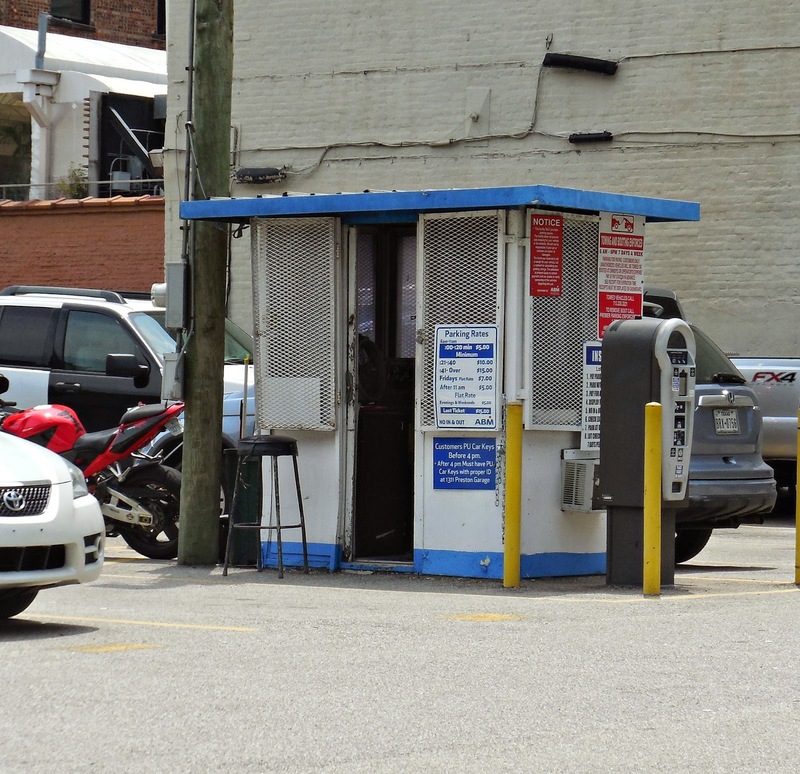 We have to remember though, we're not entitled to easy and abundant parking access. 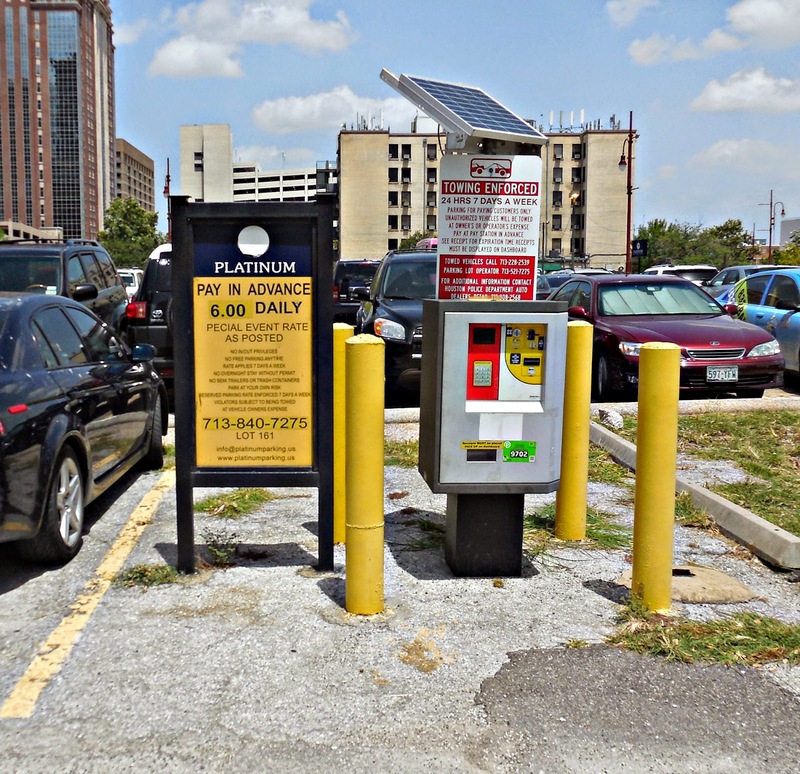 Our parking situation is extremely different than most of the world-class cities to which we compare ourselves economically, like New York or Chicago. 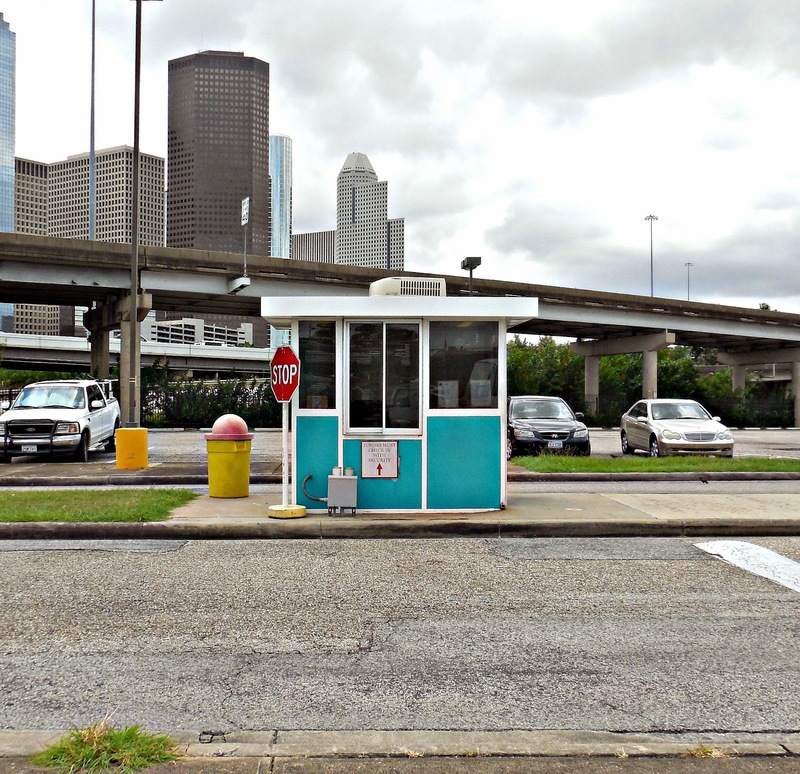 To be fair, there are not as many surface lots in Houston today as there were in the 1970's, but there are still quite a few, especially in Southeastern Downtown Houston. 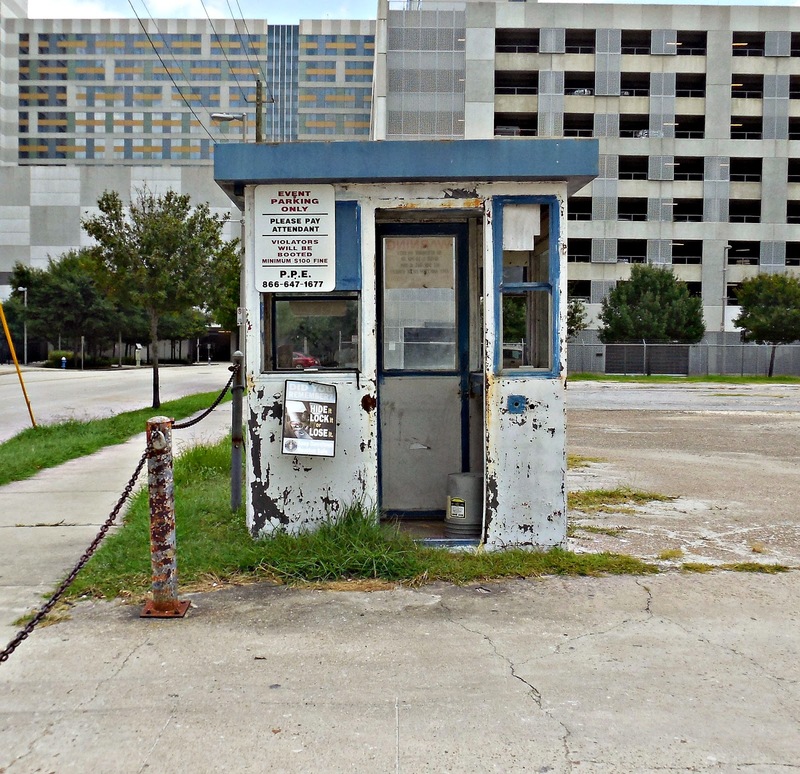 As noted in this 2013 Houston Urban Land Institute Technical Assistance Program (TAP) Report, Making the Case for Urban Green Space in Southeastern Downtown, out of the 64 blocks in the report's study area, there are currently 25 full city blocks and seven half blocks that are underdeveloped or serve as surface parking lots. 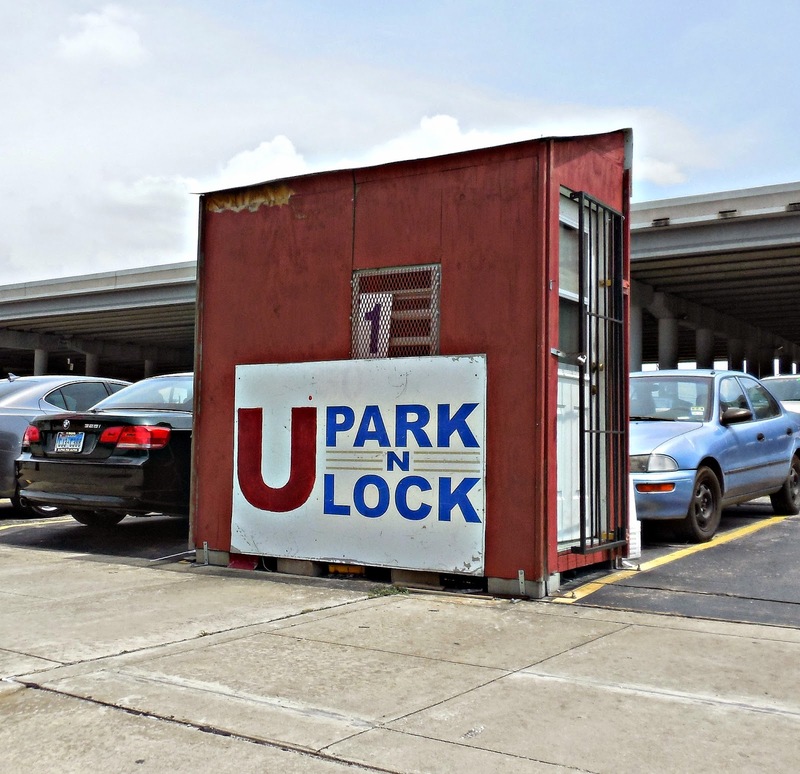 That means nearly half of that area is comprised of surface parking, hardy anything to promote in a downtown district, aside from having flat, available land that is ripe for development, which the ULI TAP report encourages. 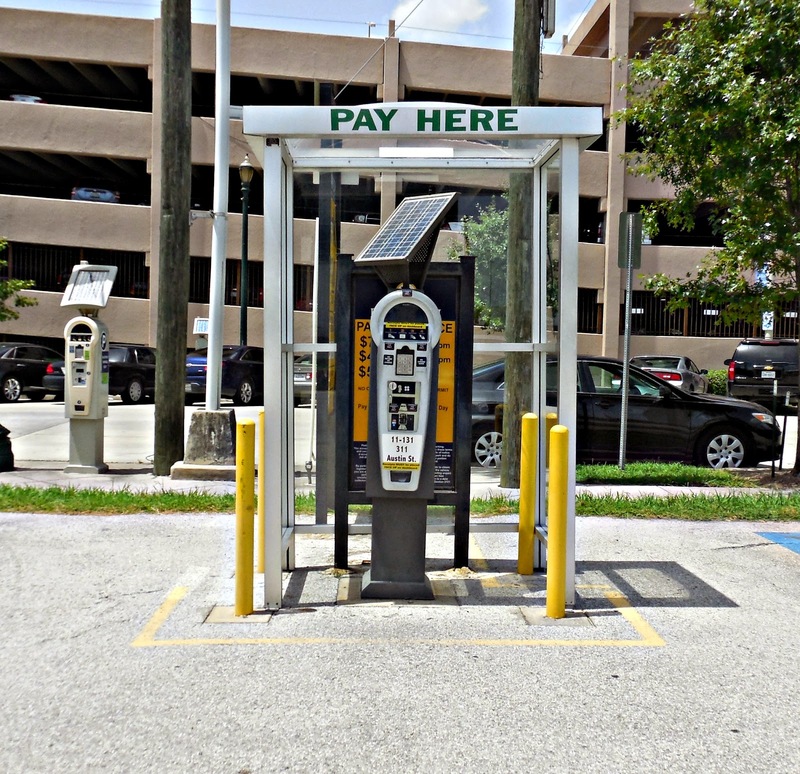 It used to be even more of a convenience than it is today. 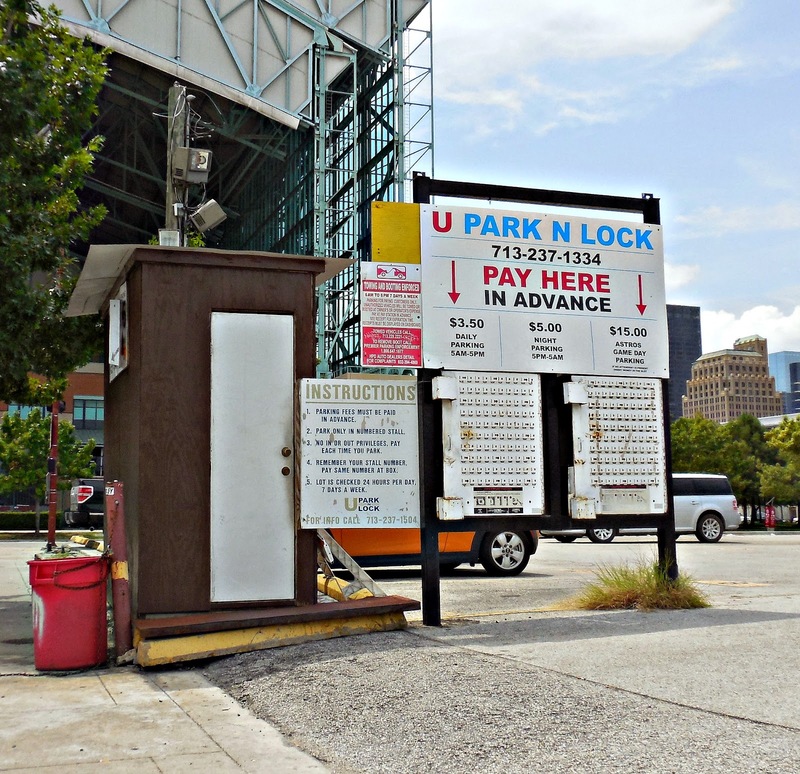 Houston's parking past can be best seen through the pictures of Alex MacLean. 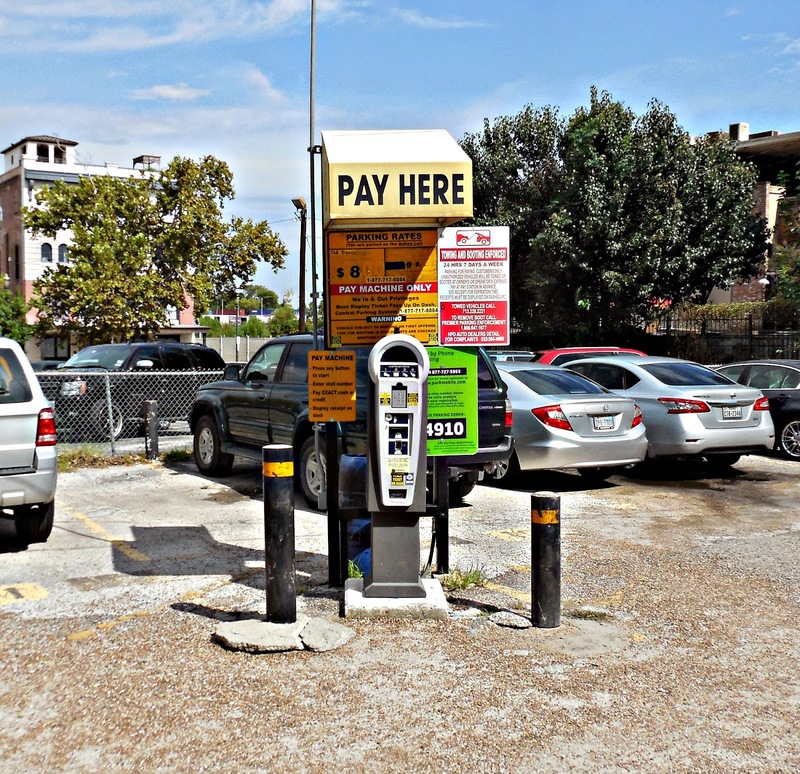 These photos, shown above, have been well-circulated between planners, including Jennifer Keesmaat, the Chief Planner for the City of Toronto, and other urbanists over the past few years. 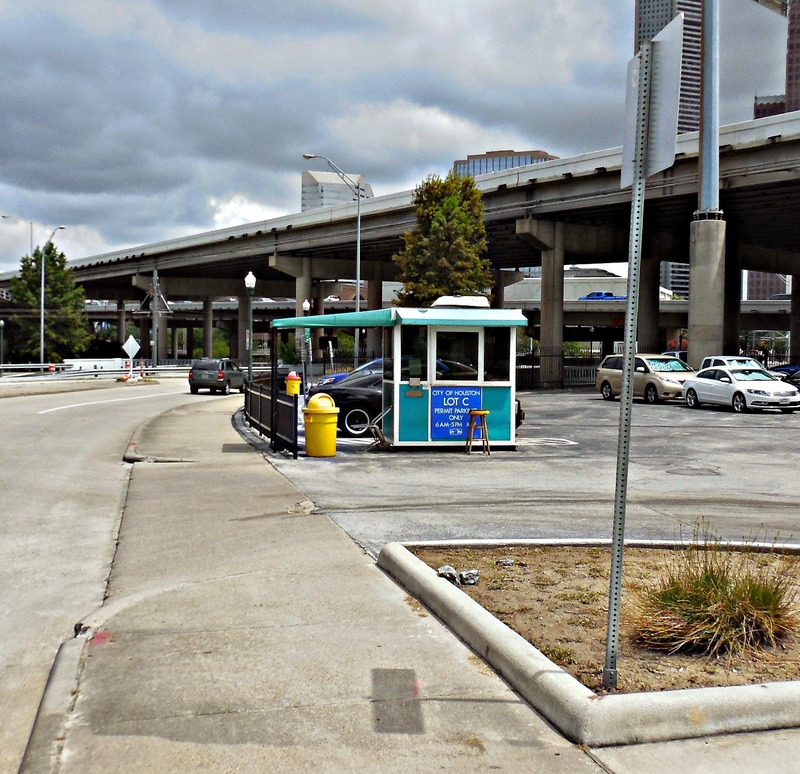 They show Houston's surface parking past as well as the seemingly surprising amount of development that has occurred in Downtown Houston since the picture was taken in 1977. 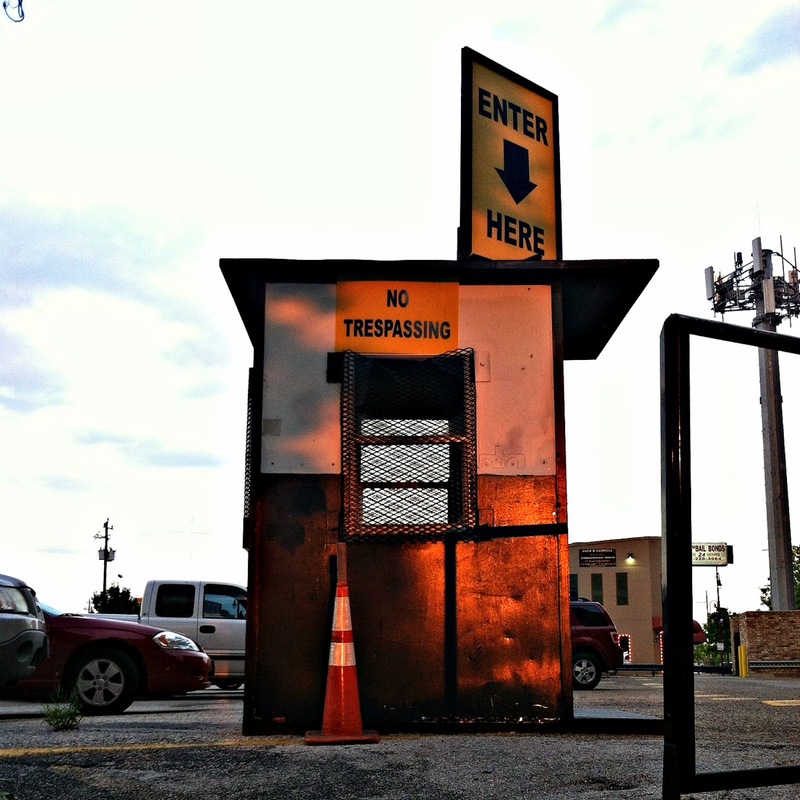 Still, more needs to be done. 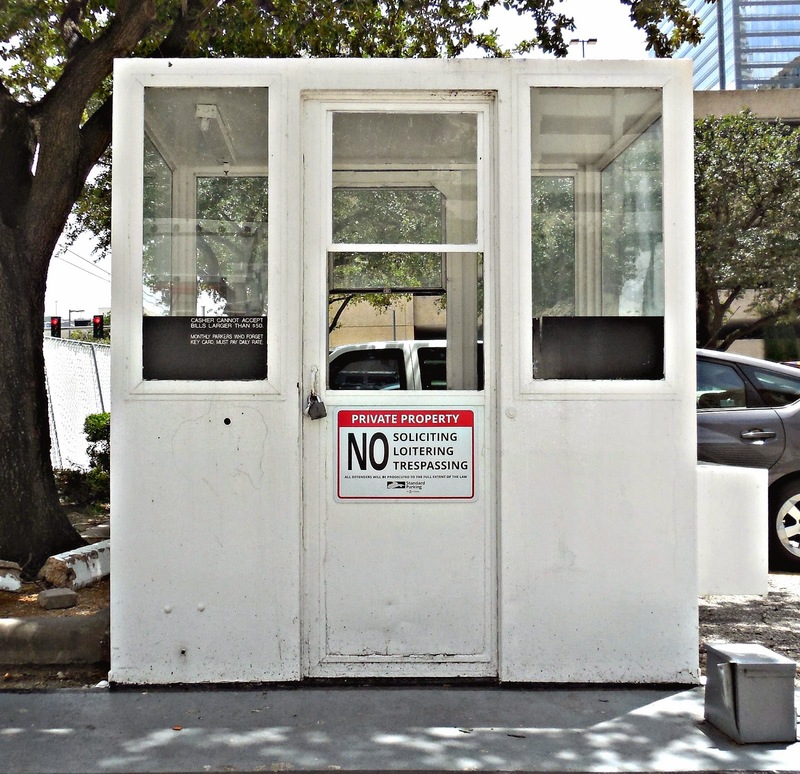 Many lots have been developed into hotels, high-rise or mid-rise apartments, entertainment faculties or offices. 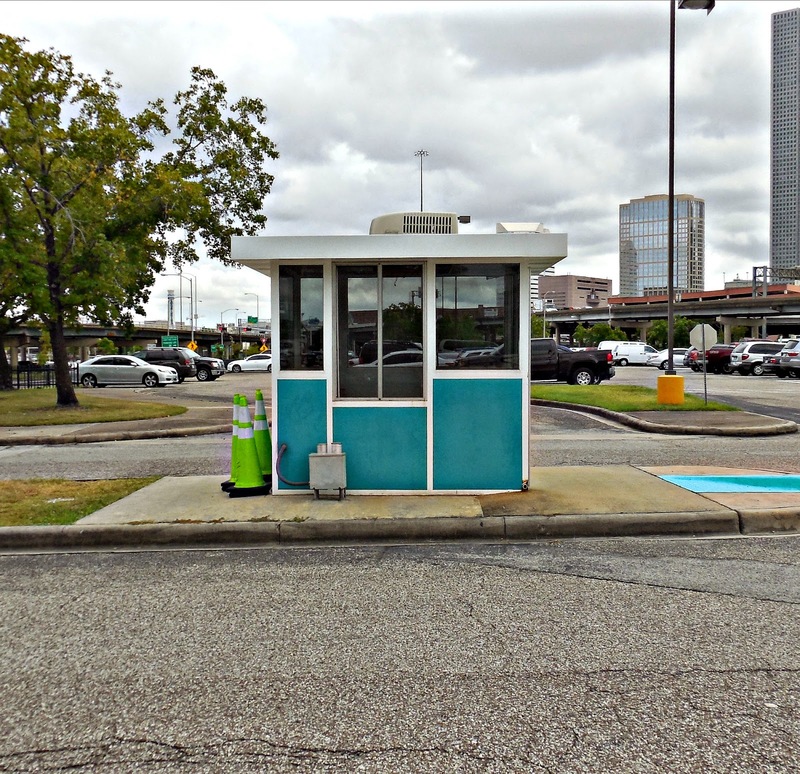 The addition of the George R. Brown Convention Center, Toyota Center, Discovery Green (which used to be a parking lot, and now has a parking garage beneath it) and Hilton Americas are most noticeable when comparing 1979 to 2011. 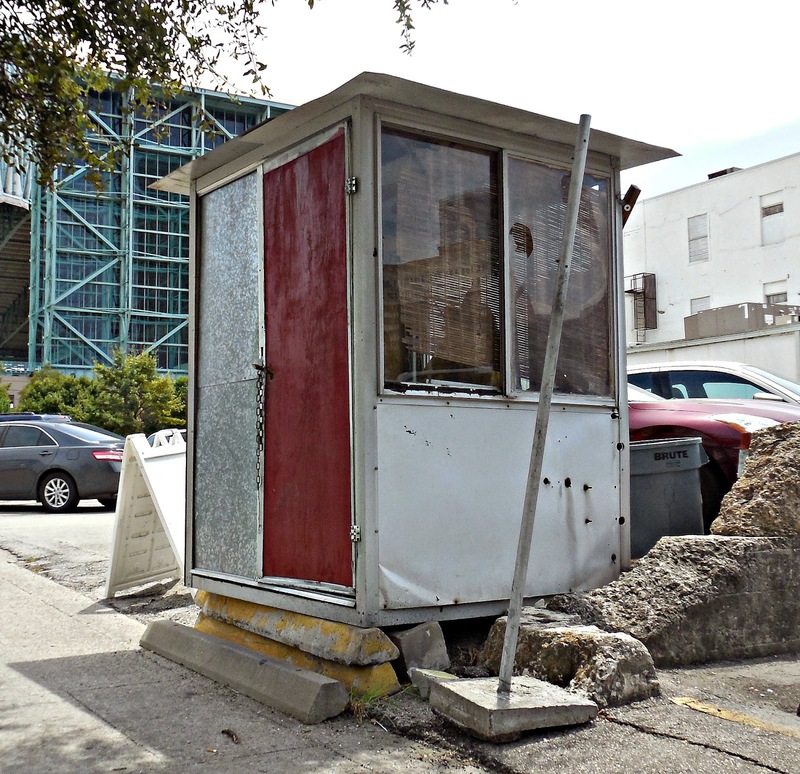 Other lots have recently been excavated, giving way to Market Square Tower, Hines Market Square, and the 500 Crawford apartments near Minute Maid Park. 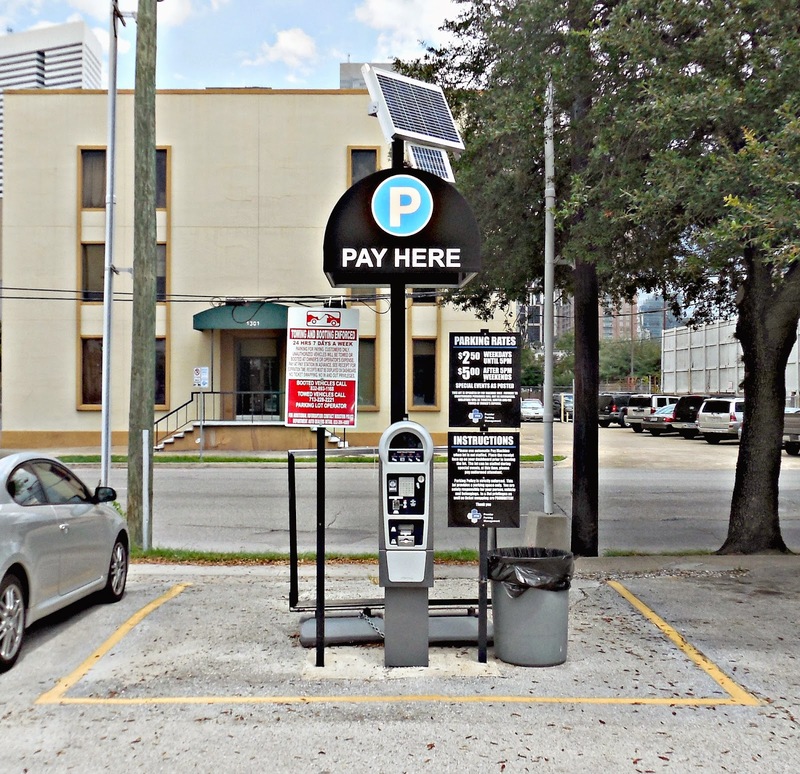 Some downtown workers have also seen parking rates increase in garages in the downtown core, another reminder that parking is becoming less abundant, and a car ride into work capped off by cheap parking in a downtown district is not an entitlement. 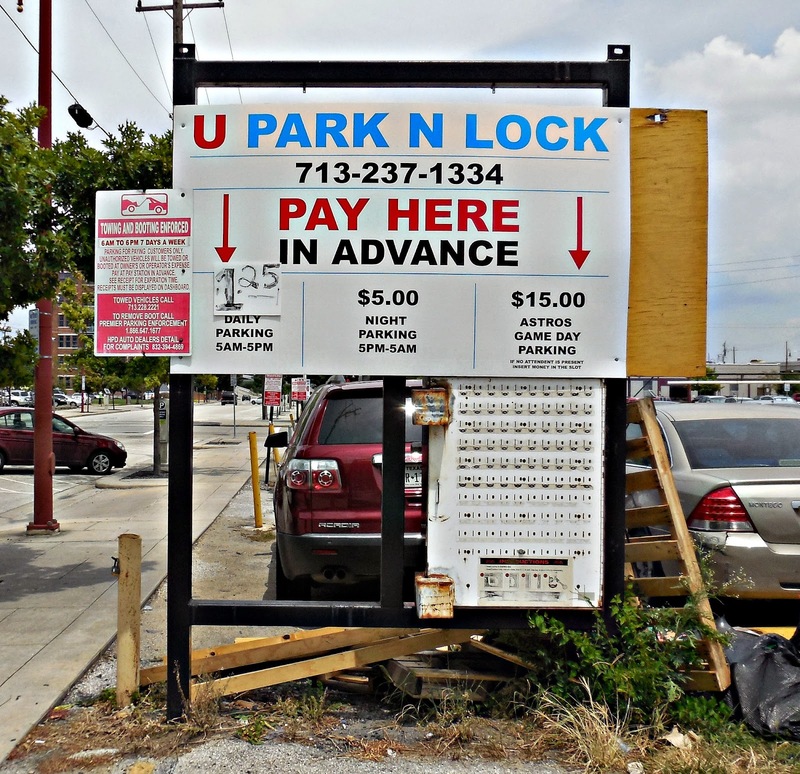 Just like Houston, Detroit has a close relationship with cars and surface parking. 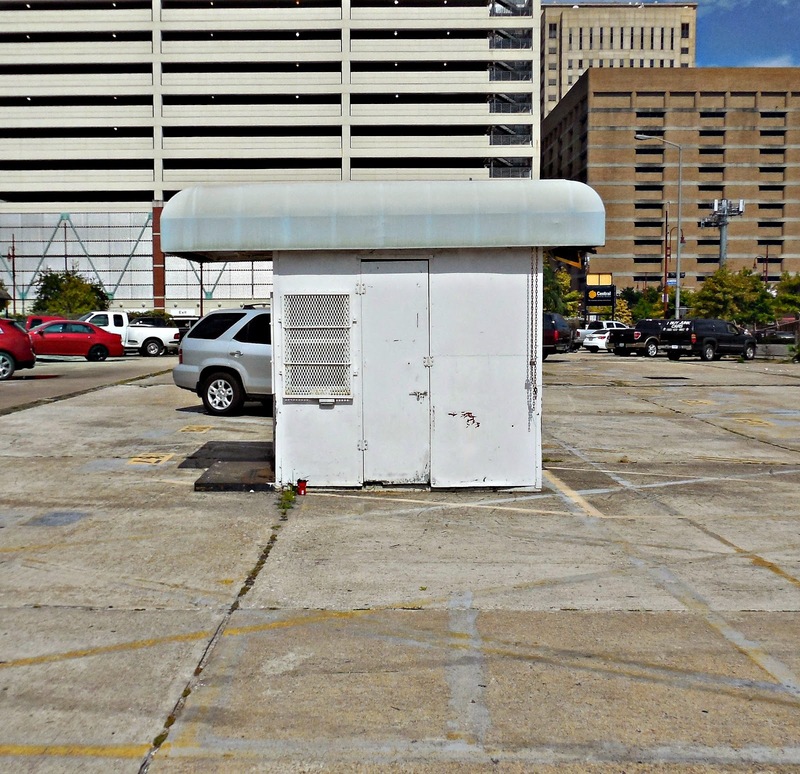 A few weeks ago Curbed Detroit posted a gallery of "30 Unique Parking Huts Found Across Detroit", from Detroit photographers Michelle and Chris Gerard. 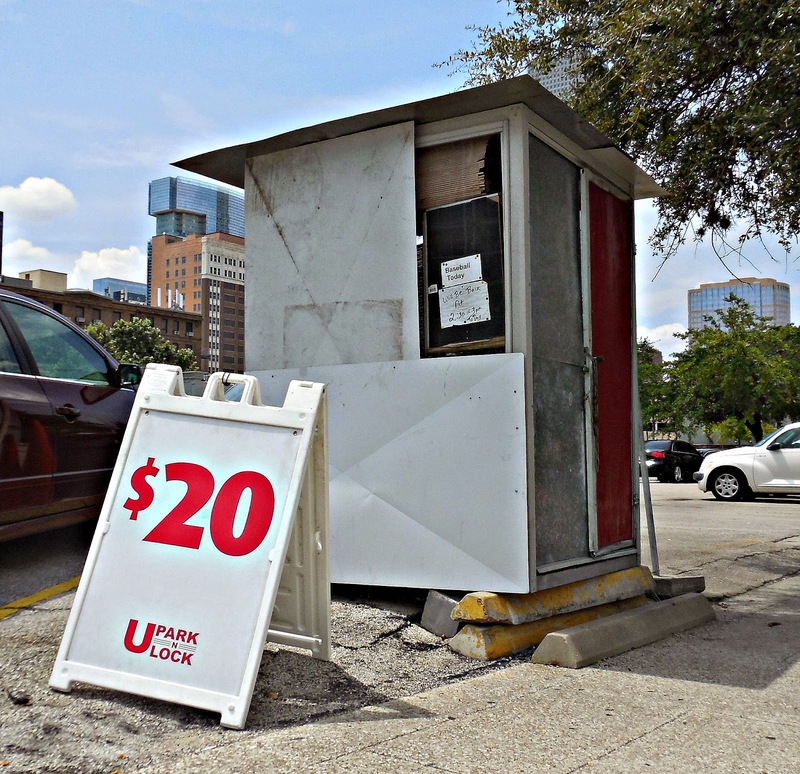 Most surface lots here in Houston have migrated to automated payment machines or honor boxes, eliminating the need for parking huts, but there are still some huts out there. 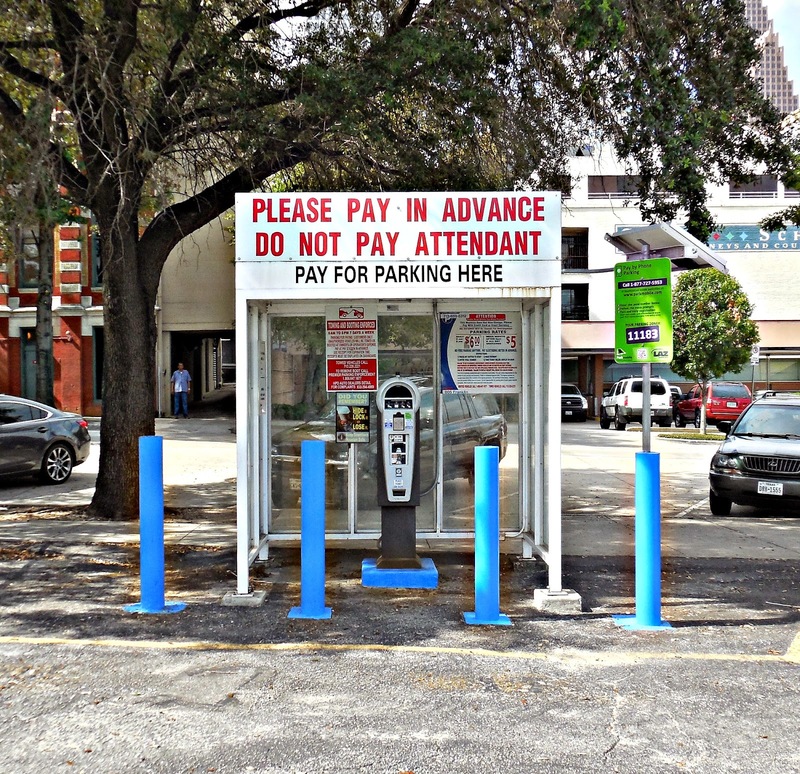 Some simply provide shelter for lot attendants from the oppressive Houston heat, some are fully functioning and collecting fees, and others have long been abandoned. 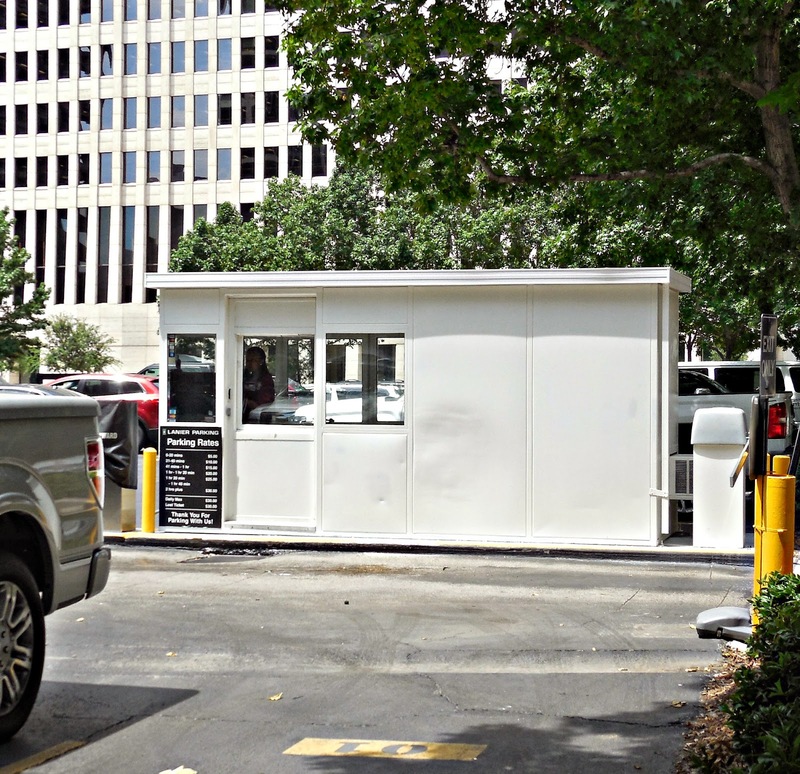 There are about 100 public surface lots in Downtown Houston, and they've each got their own character. 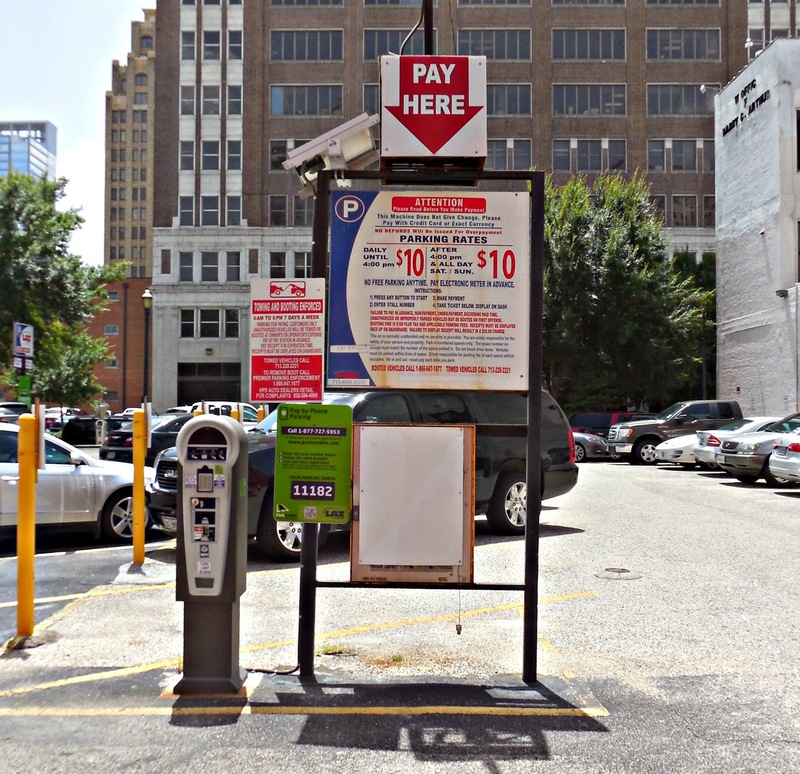 (Downtown Houston has also recently released a list of each parking lot and garage, as well as their hours and rates.) 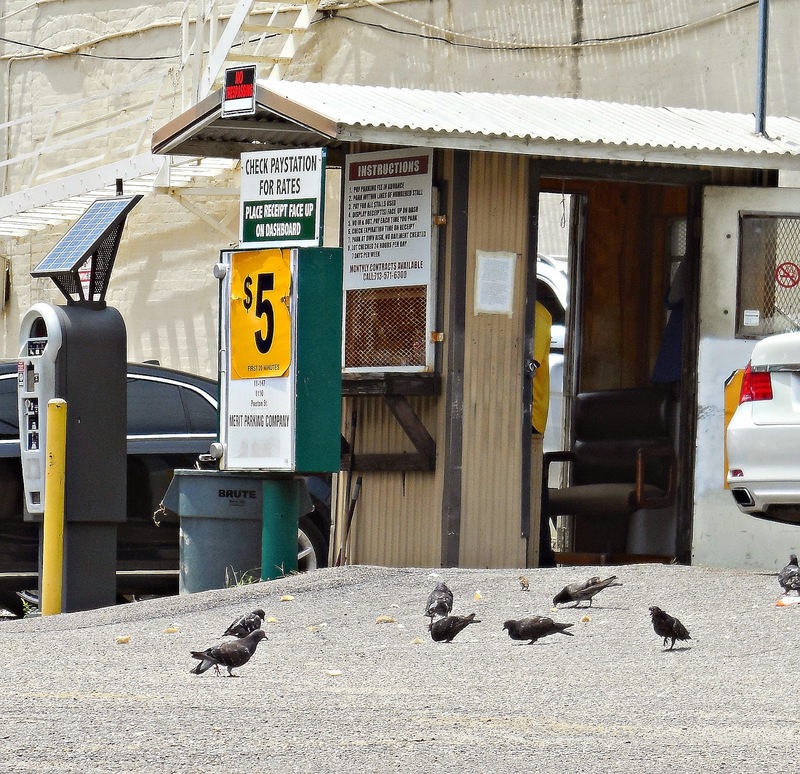 Some have attendants and parking huts, however most lots have migrated to pay stations or honesty boxes. 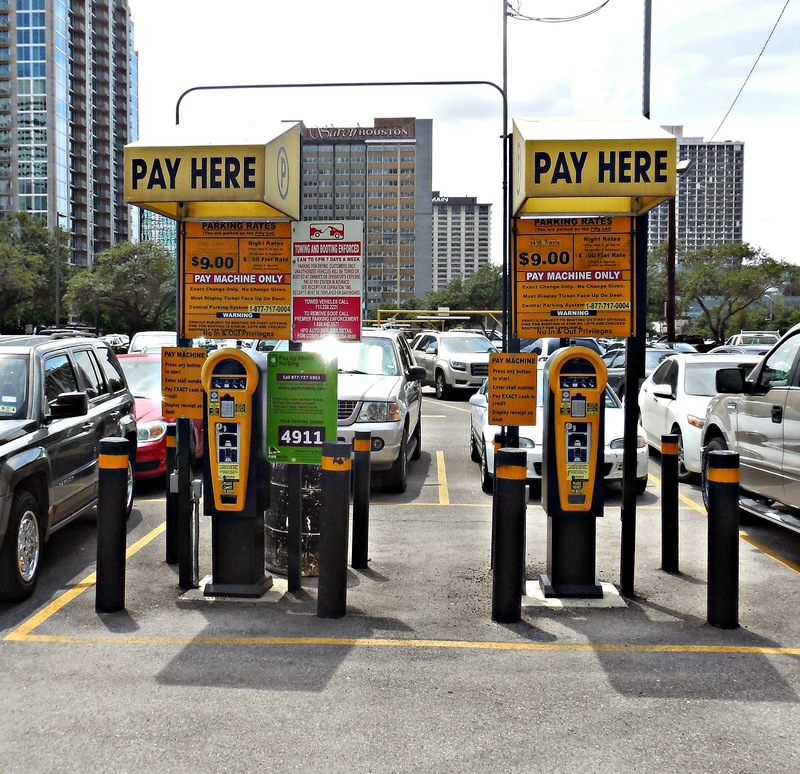 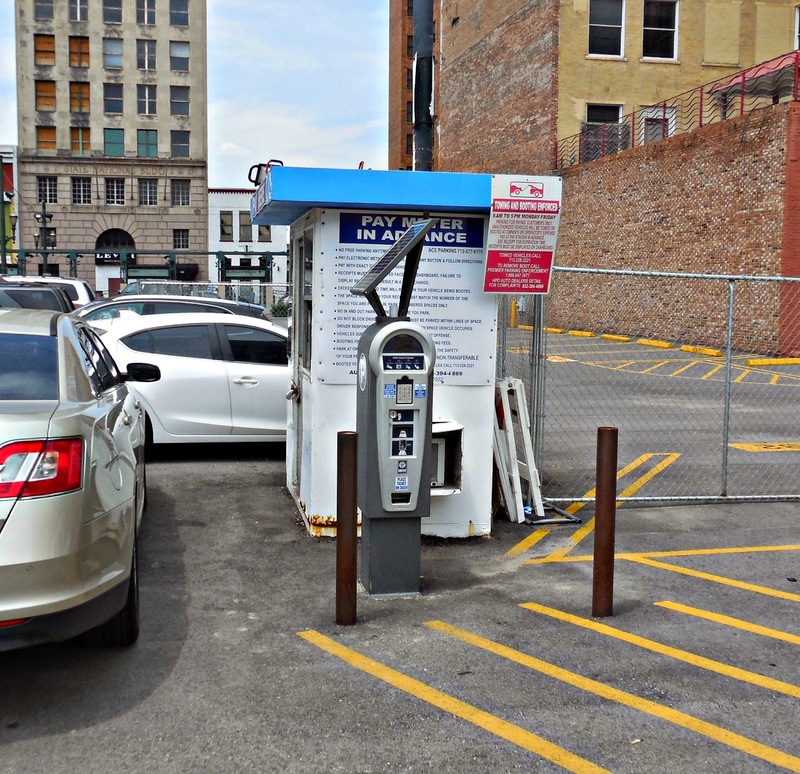 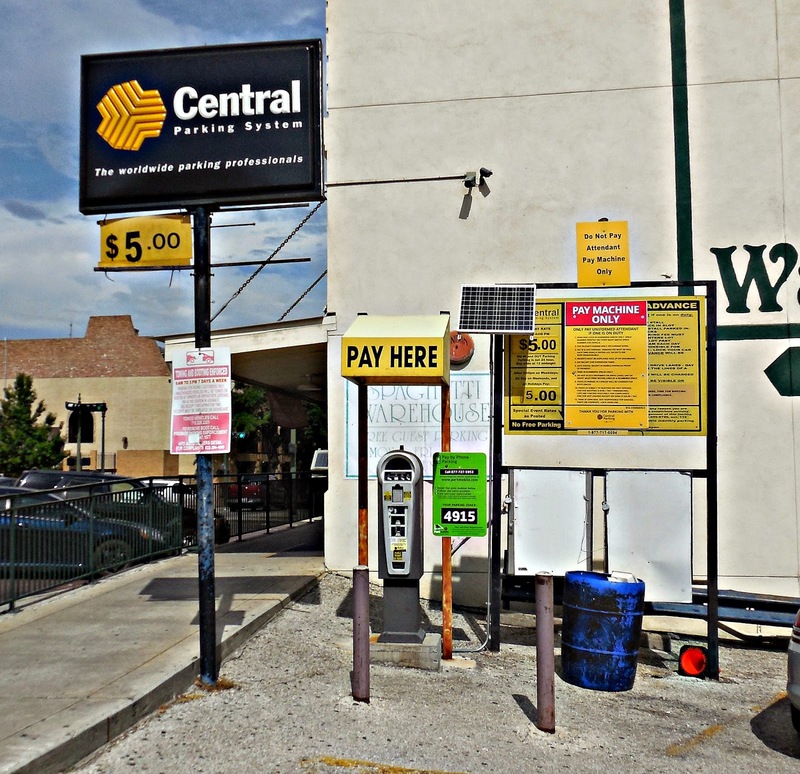 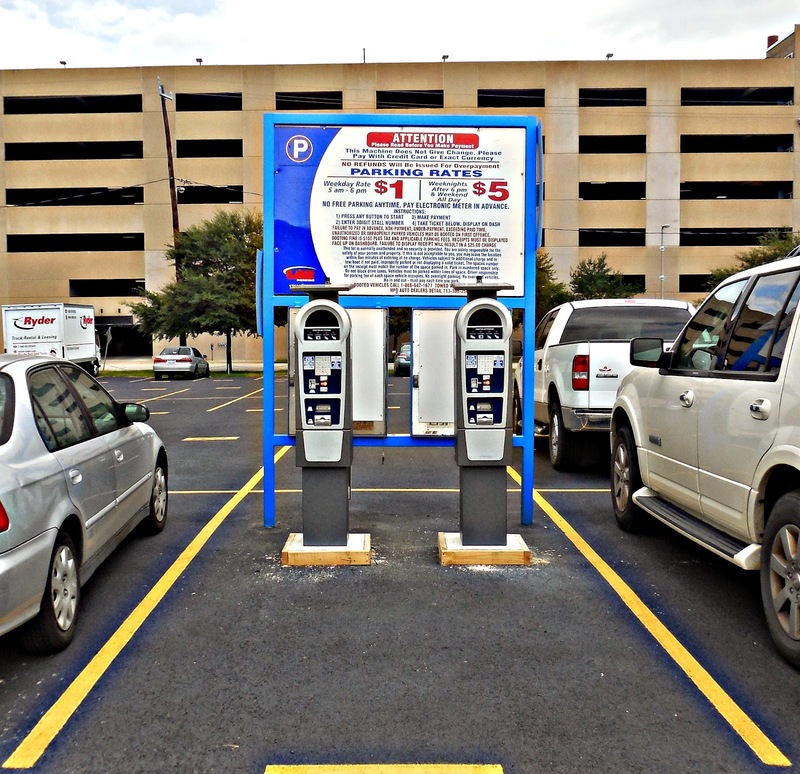 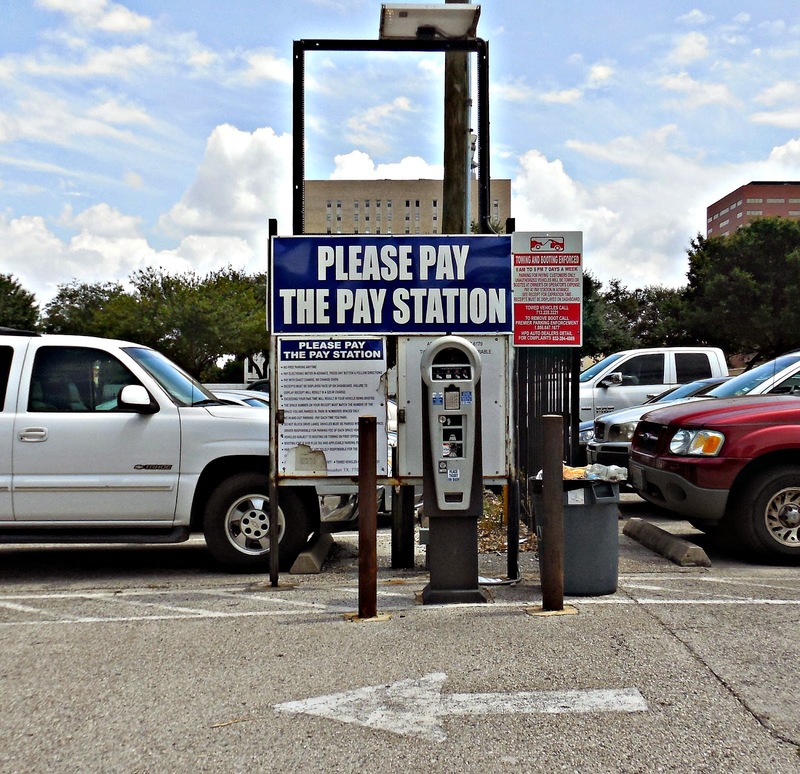 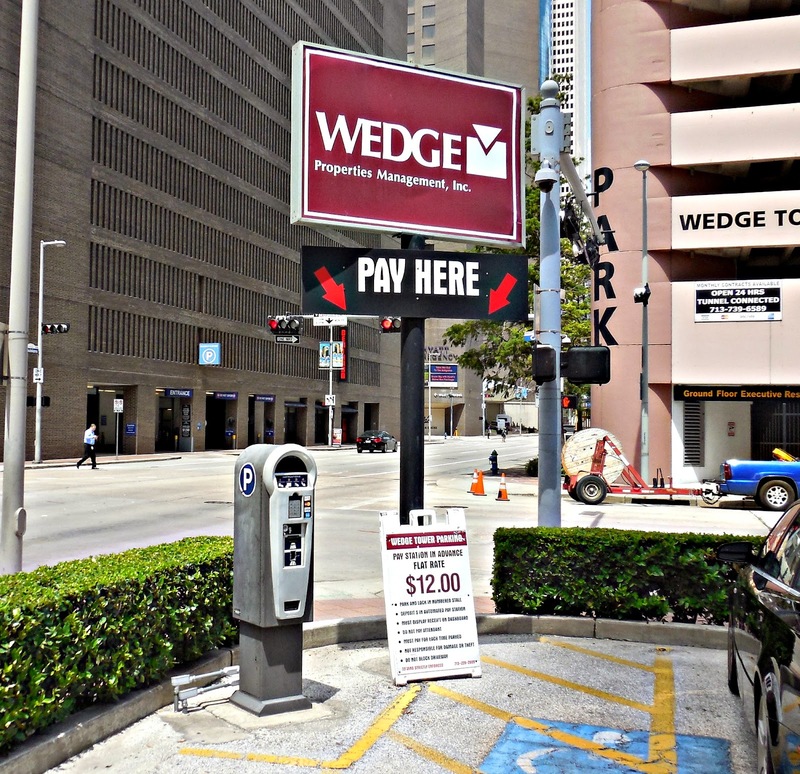 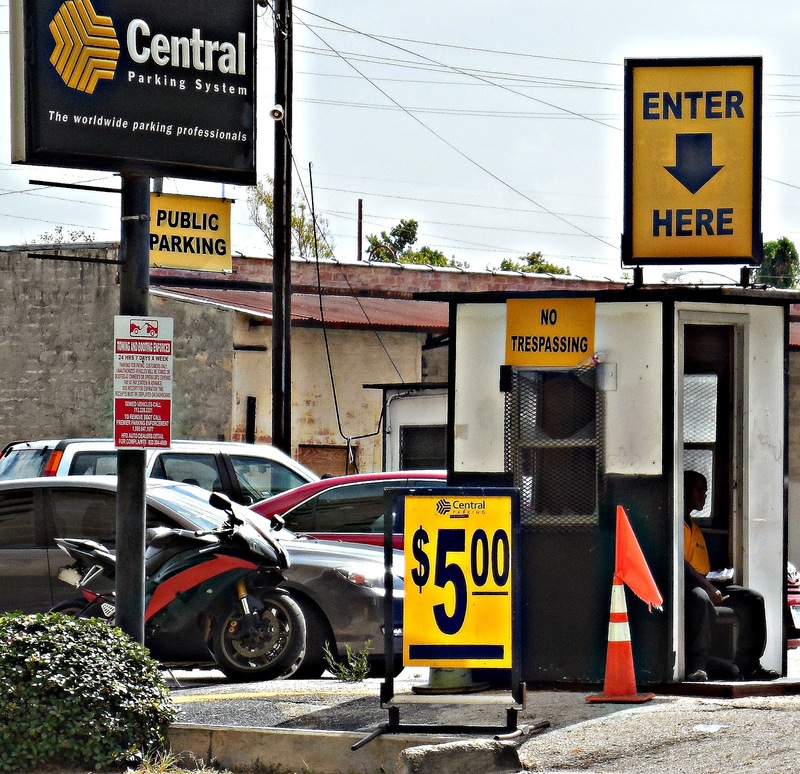 I've compiled a nearly comprehensive collection of Downtown Houston's surface parking lot pay stations, parking huts and honor boxes, and a slide show of all of them is below. 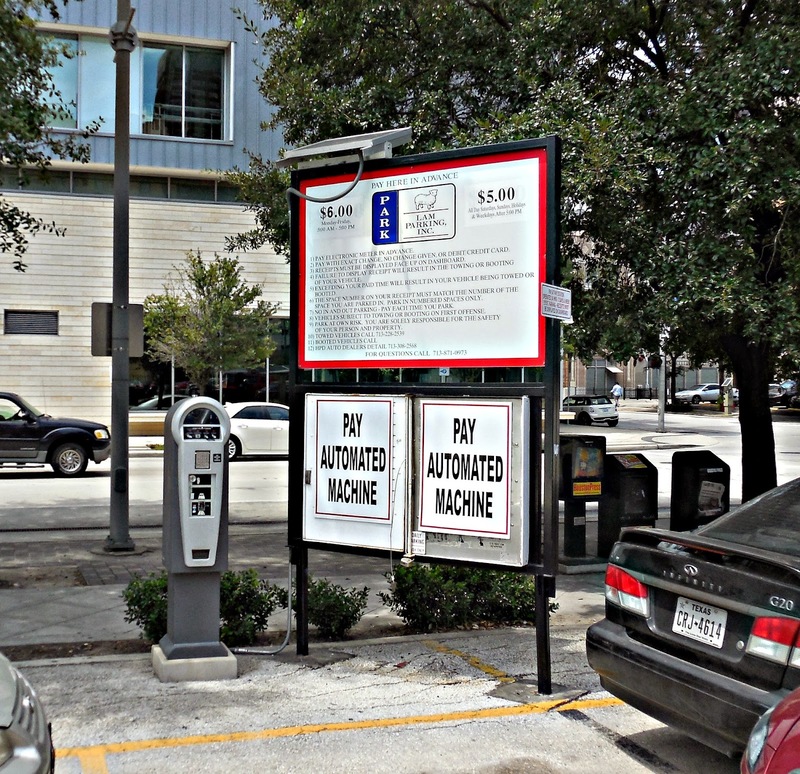 You can also view them here. 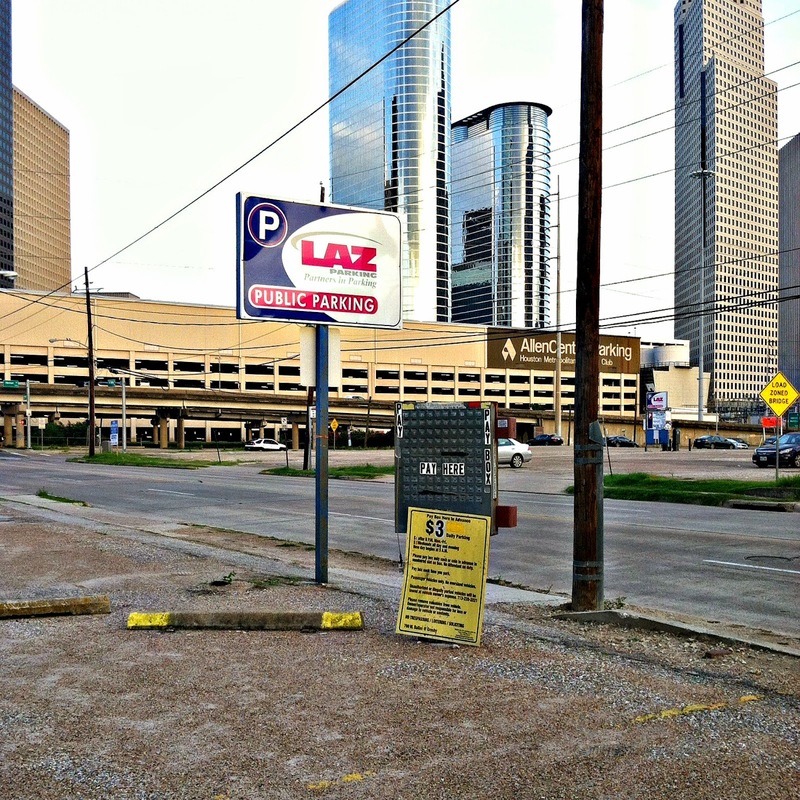 On a playful note, Houston-based LAM Parking Inc. manages a number of Downtown Houston surface parking lots, so upon visiting each lot I was amused to find a lot owned by Lyon Parking, LLC. 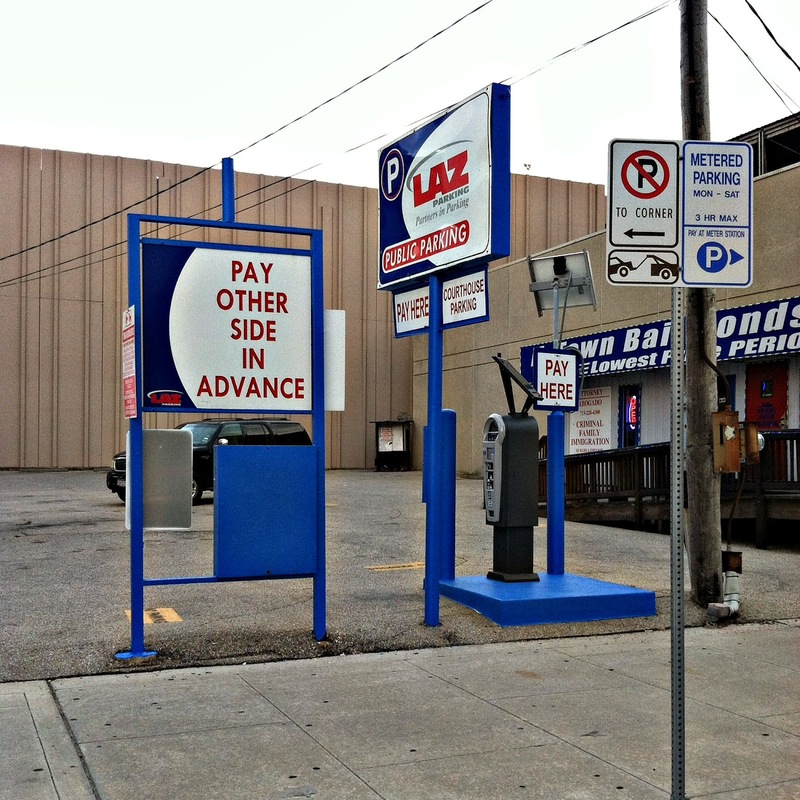 I'm guessing the lion/lamb biblical metaphor playfulness among competing parking interests is of no coincidence. 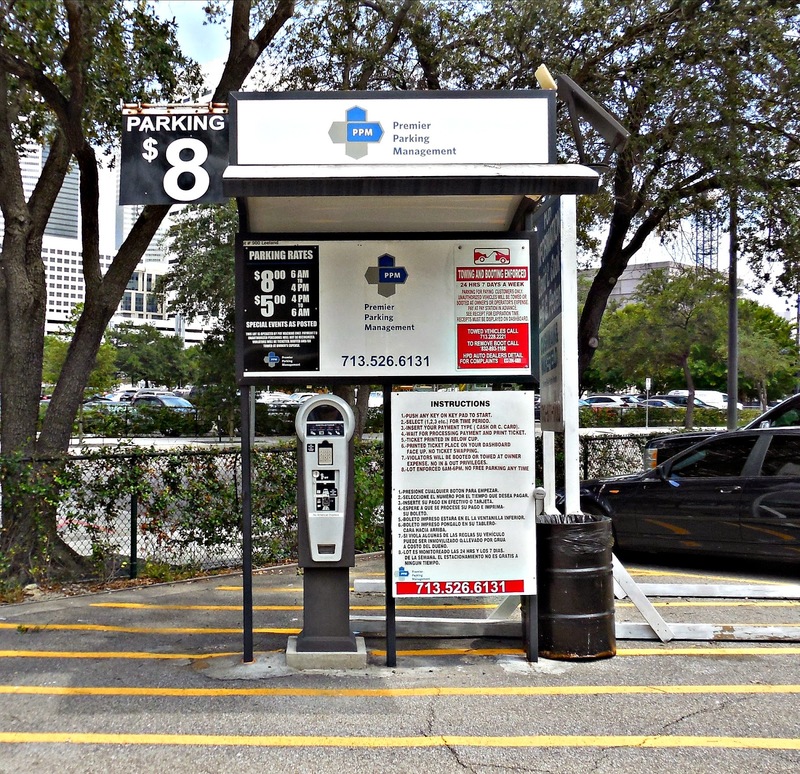 I noticed the pricepoint for most of the downtown lots is pretty affordable in comparison to the Medical Center where it is $10-$12 a day to park. 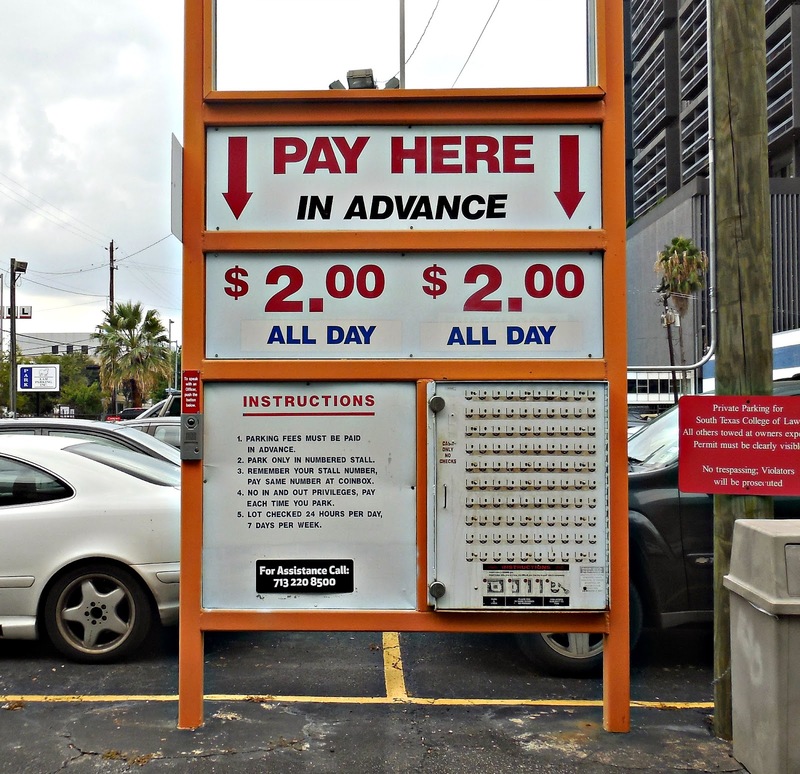 There are cheaper lots in some places but they are a really long walk from the hospitals. 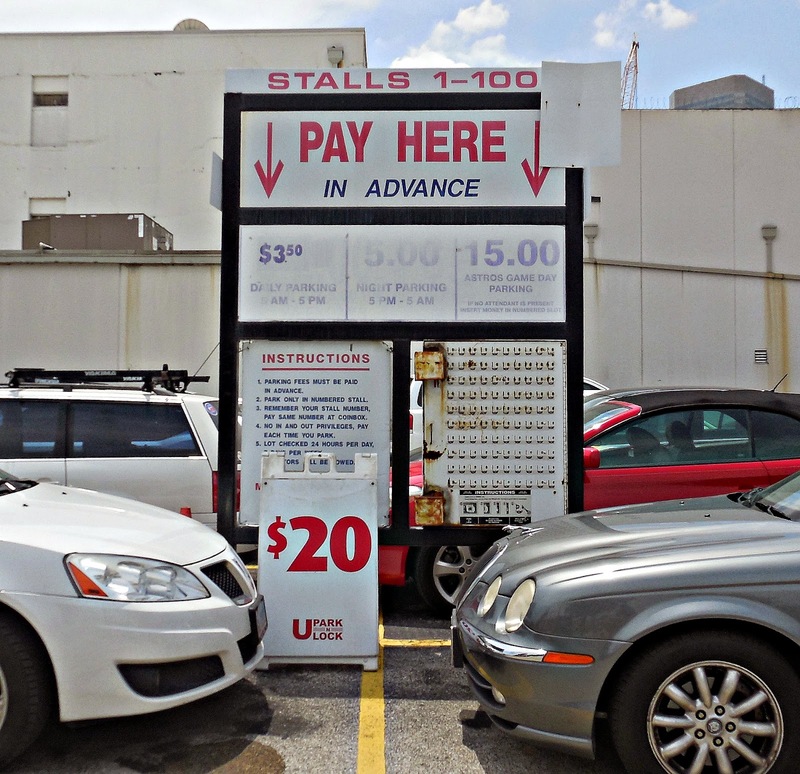 However, even the Medical Center doesn't have anything on the prices I saw in my recent trip to Boston where I saw garage prices as high as $36 dollars a day! 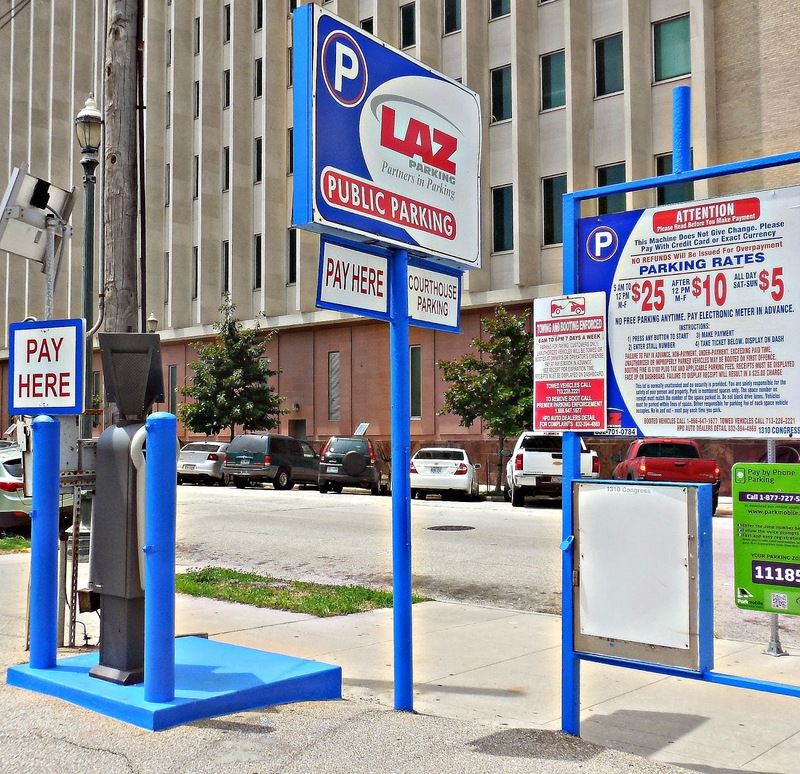 You explained very well about surface parking in downtown. 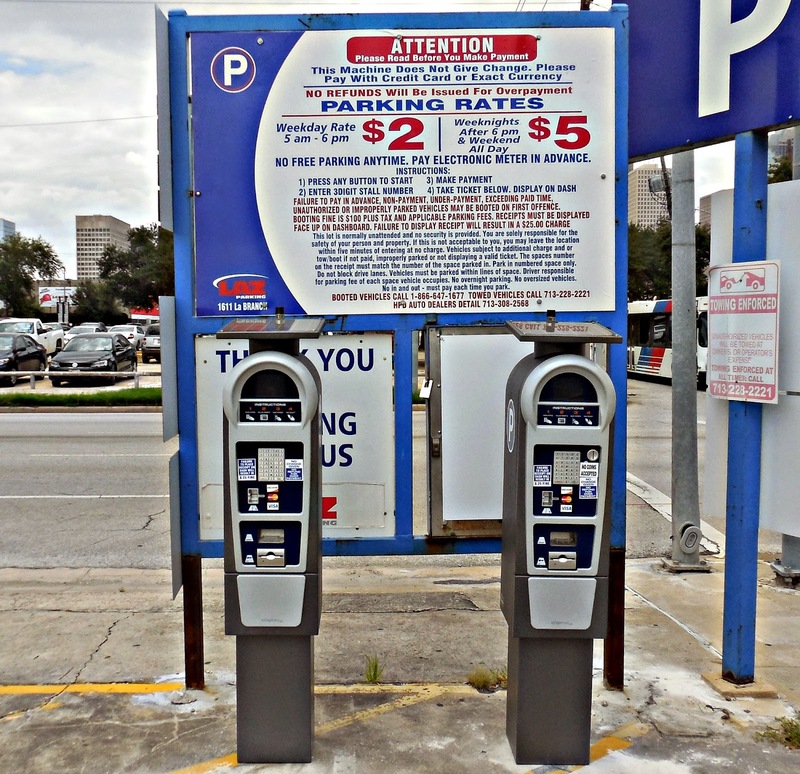 Parking charges is very high near downtown. 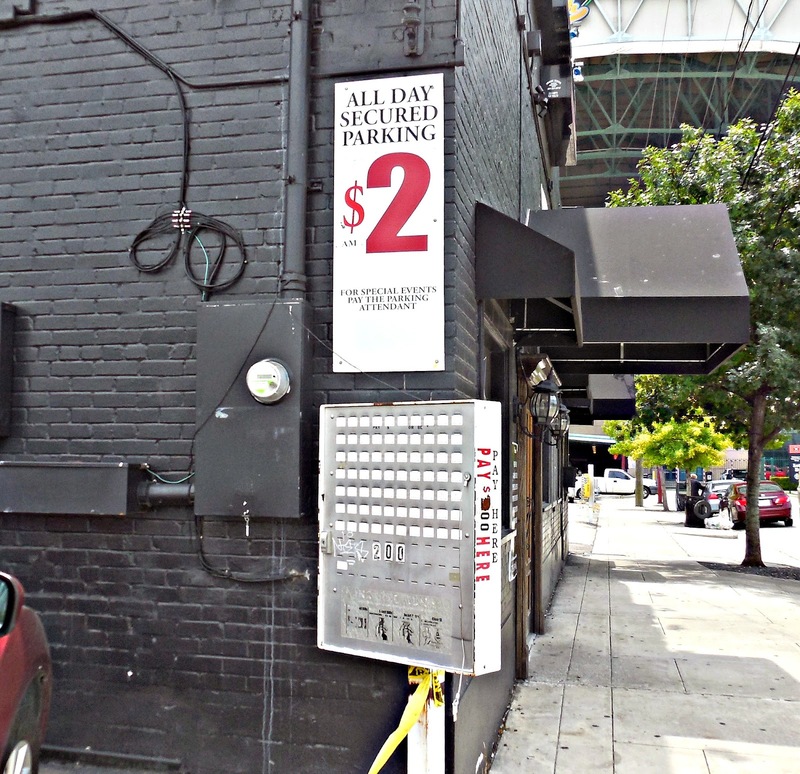 If you live in UK then get benefit of meet and greet Birmingham and save a lot of money. 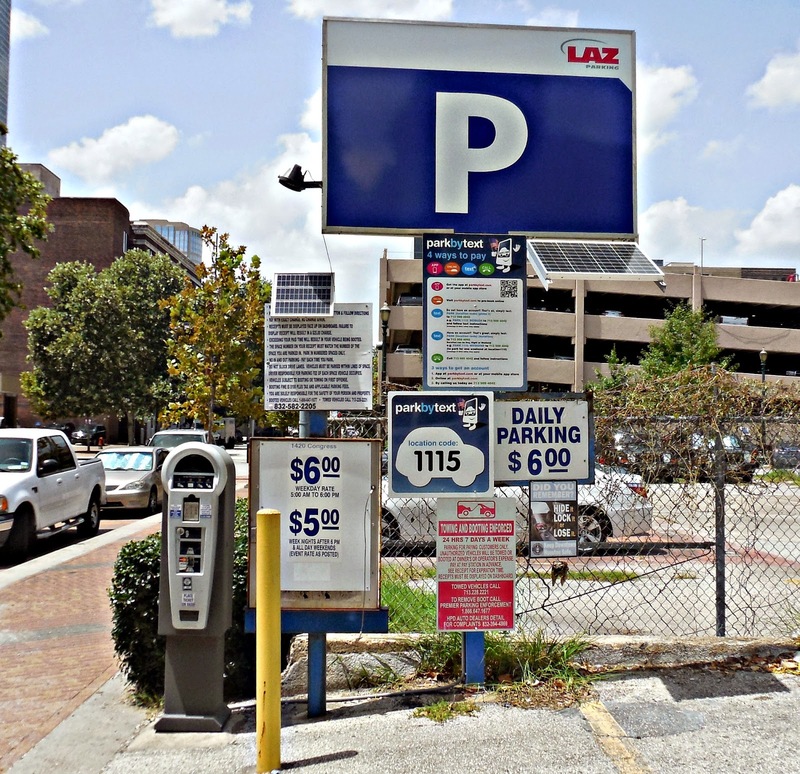 Surface parking lot in downtown could be charged high rates. 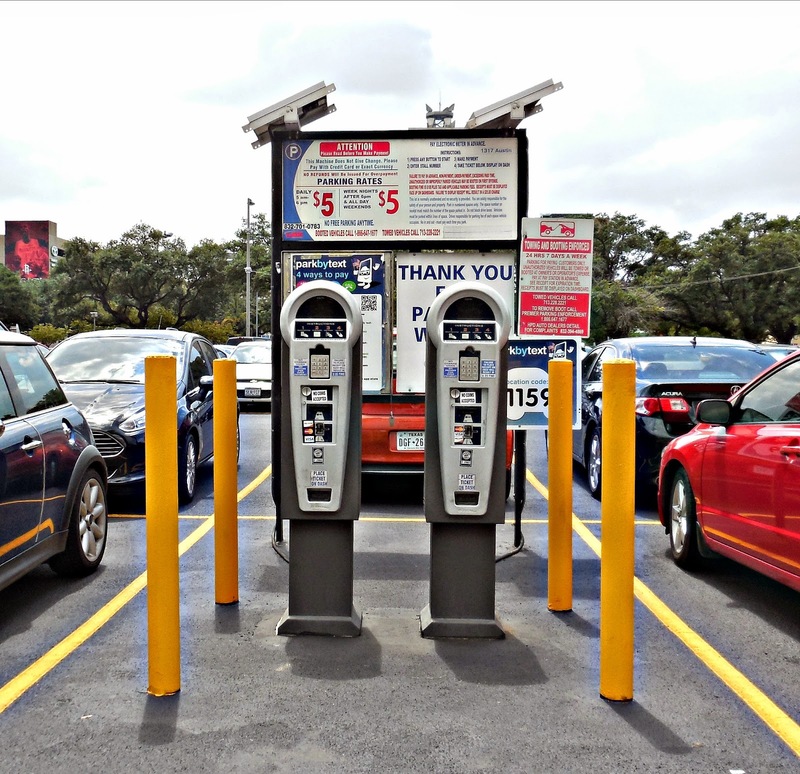 If you're planning to travel soon from the UK then try airport parking Luton.